How Is Clinical Depression Different From Sadness? Clinical depression is similar to sadness in many ways, but is not the same, and the two have marked differences. Clinical depression is an illness that needs some kind of medical intervention to cure, whereas sadness is something that most people will experience at some point in their lifetime, owing to the fact it is a natural emotional response to certain situations. Read on to discover more about depression and how it is different from the emotion of sadness. Clinical depression is a psychological condition that means the sufferer is in a constant state of melancholy and finds it impossible to “cheer up” or have a positive attitude. As such, thinking often becomes distorted until the sufferer sees all situations and events through a negative lens, and this can result in behaviors that isolate them from loved ones and have an adverse effect on daily life. This condition is estimated to affect as many as 10% of the adult American population, and depression statistics seem to suggest that women are twice as susceptible as men; this is due to the fact that women experience far more hormonal imbalances throughout their lives than men, but it could also be a result of men being less likely to talk about their problems. The risk of developing clinical depression also increases with age, so older women should be mindful of symptoms and report to their doctor if they have any concerns about the illness. How Is it Different From Sadness? 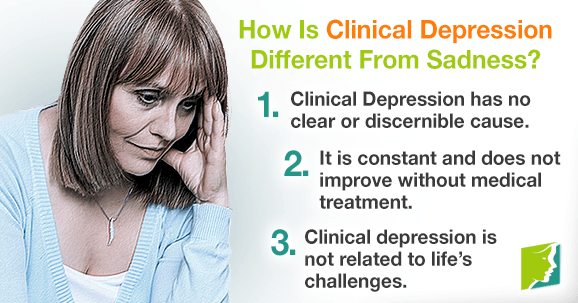 There are many symptoms of clinical depression, and these can differ from sadness. Sadness is a natural reaction to losses or disappointments, and it would be unusual to go through life never experiencing it. With sadness, there is a clear cause, whereas with clinical depression, there is often no apparent reason for the negative feelings, making them harder to deal with. Sadness has an endpoint. Healthy people will rebound from the sadness eventually and move on. However, with clinical depression, this does not happen; the negativity will persist until the sufferer receives clinical treatment. Clinical depression will often be out of proportion to life's challenges. For example, the smallest of triggers can be followed by uncontrollable crying fits or days and weeks of anxiety, sadness, or lethargy. Sadness, on the other hand, is usually proportional to the situation at hand. Although sadness and clinical depression are similar in the symptoms that can be experienced, there are obvious differences, such as the length of time it lasts, the causes, and whether the reactions are appropriate. At first, depression might seem like sadness, but if it goes on for more than two weeks, it is important to see a doctor, who can assess whether it is clinical depression or not. Are Vitamins the Solution for Depression?